The Benjamin Franklin Educational Foundation on behalf of the Benjamin Franklin Classical Charter Public School is pleased to announce their upcoming move to 500 Financial Park Drive in Franklin. 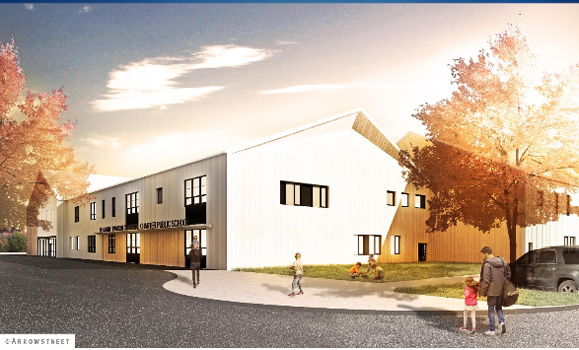 The Benjamin Franklin Educational Foundation will be breaking ground in the spring of 2018 with a planned opening of the new 72,000 square foot building for the 2019-2020 school year. This process included an extensive review by the Franklin Conservation Commission, the Franklin Planning Board and Massachusetts Environmental Policy Act Office (MEPA). Financing for the project has been secured through a bank group led by Citizens Bank. Project management of the new facility is being provided by Daedalus Project, Inc. and the building has been designed by leading architectural firm Arrowstreet. The educational program at BFCCPS offers a strategic partnership with parents, rigorous academic program, foreign language instruction, commitment to arts education, character education, and community service activities. With the opening of this new building the Benjamin Franklin Classical Charter Public School will be able to welcome more families than ever before possible. For the 2019-2020 academic year, BFCCPS will increase enrollment from 50 students to 92 students per grade in Grades Kindergarten through Grade Five. Over the next ten years, enrollment will expand from the current cap of 450 students to a total of 900 students. Families that are interested in enrollment at BFCCPS can learn more at www.bfccps.org/about/enrollment and candidates for employment are encouraged to follow http://bfccps.org/about/employment/ for ongoing information. The Benjamin Franklin Classical Charter Public School’s mission is to assist parents in their role as primary educators of their children by providing students with a classical academic education coupled with sound character development and community service. Our mission is supported by four distinct, yet interconnected pillars that provide for a collaborative, rigorous education for all students. These pillars guide, direct and define the school in all it does. Learn more at www.bfccps.org or visit us on Facebook. Citizens Financial Group, Inc. is one of the nation’s oldest and largest financial institutions, with $151.4 billion in assets as of September 30, 2017. Headquartered in Providence, Rhode Island, Citizens offers a broad range of retail and commercial banking products and services to individuals, small businesses, middle-market companies, large corporations and institutions. Citizens helps its customers reach their potential by listening to them and by understanding their needs in order to offer tailored advice, ideas and solutions. In Consumer Banking, Citizens provides an integrated experience that includes mobile and online banking, a 24/7 customer contact center and the convenience of approximately 3,200 ATMs and approximately 1,200 branches in 11 states in the New England, Mid-Atlantic and Midwest regions. Consumer Banking products and services include a full range of banking, lending, savings, wealth management and small business offerings. In Commercial Banking, Citizens offers corporate, institutional and not-for-profit clients a full range of wholesale banking products and services, including lending and deposits, capital markets, treasury services, foreign exchange and interest rate products and asset finance. More information is available at www.citizensbank.com or visit us on Twitter, LinkedIn or Facebook.